This painting depicts age and class inequalities in gender relations and courtship. 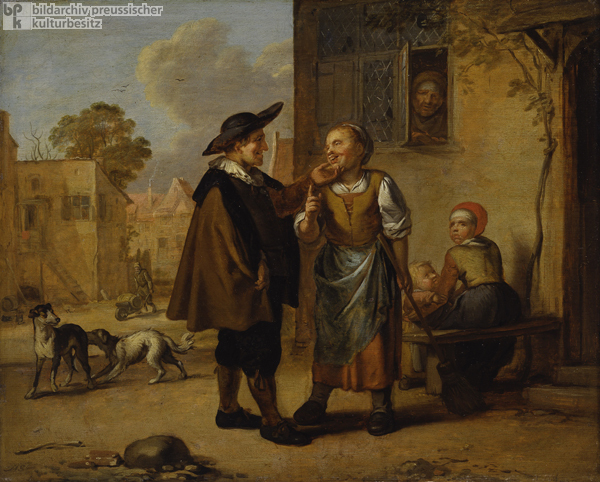 A well-dressed older man, whose clothing identifies him as a member of the bourgeoisie or landed gentry, chats and flirts with a peasant girl in front of a farmhouse. The girl appears to reciprocate, laughing and wagging her finger. But the man’s general countenance – not to mention the way that he holds the girl’s chin – makes clear that the balance of power is on his side. The pair is observed by an old woman who peers from the farmhouse window, and by a younger woman who is tending to an infant. Their expressions suggest a mixture of surprise and disapproval. This painting’s lively narrative style and muted colors are characteristic of its maker, the Hamburg-born painter and etcher, Matthias Scheits (c. 1625/30-c.1700), who worked in the Dutch tradition, painting subjects from peasant life. Oil on oak by Matthias Scheits, late seventeenth century.